2009 was the year that my 4th of July lasted for 42 hours, at least that’s the best I could calculate it at the end of the day. 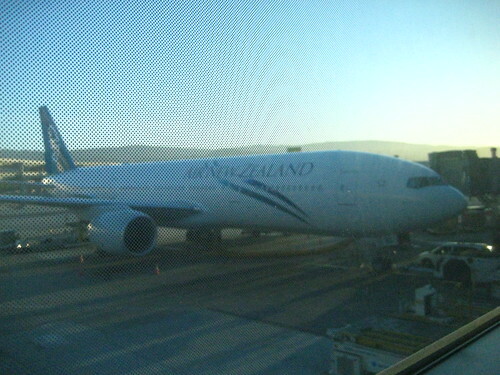 Much of the day was in Auckland, New Zealand, then the flight to San Francisco, a four hour layover, and then five more hours across North America. A bit ragged this morning. I’ve been been reflecting, though, about my NECC experience — especially the conversations at the Leadership Symposium and a couple of the conversations I had at the EduBloggerCon. The idea is starting to jell in my mind that the next big… Hmmmm! As I wrote yesterday, it seems that everytime we sit down and talk about education reform, there seems to be something in the way, preventing us from what we want to do right now. We can’t move that tile in the puzzle, until the one next to it is out of the way, which we can’t move until another one has been shifted, etc. etc. There is only one open space in the old Cracker Jack puzzle game, and often only two tiles that can be shifted to make room. In our particular game of education reform, it seems to me that there is only one tile that can be moved into one empty space. But when that one is shifted, a domino affect may result, leaving room for a sudden and complete overhaul of education. That tile is how we assess the quality of education for the sake of accountability — namely the high-stakes government issued tests. No surprise here. We’ve all had this conversation. And we are starting to feel that there is a new spirit for doing things differently. However, accountability continues to be a focused part of conversations, especially in the monologs coming from the Education Department — and I don’t think we should hold our breaths for any proclaimations of a different kind of assessment coming from Washington. So what might spark the change. What might the catalyst be. What’s going to jolt us to a new level. I’m wondering if the next killer app, at least for education, might be a highly innovation new eportfolio platform. It will be something that we all get so excited about, that we’ll all want to use it. We’ll want our communities to be excited about it. We’ll want to switch to eportfolio assessment, because we’ll want to use this new thing. It won’t be just a digital folder. The killer eportfolio app will be about much more than assessment. It will be used all year long, not just at assessment time at the end of the year. It will be a work platform, not just an archive for assessment. It will have elements of social networking, featuring personal profiles and a variety of communication devices, such as blogging, micro-blogging, discussion forums, and commenting. It will easily and invitingly accept multimedia products. All products will be critiqueable with commenting or threaded discussion, by educators, fellow students, and the verifiable community. It will also have components of a course management system. There will be curriculum structures within the platform so that work can be aligned, at least implicitly, with instructional objectives. There will be a facility to critique work based beyond mere foundational standards. Work will also be judged on inventiveness, collaboration, quality of communication, compellingness, value to an authentic audience. “Standards” will play a minimal roll in this product. It will facility portability, so that students can carry their portfolios with them to the next grade and/or as a standalone product on CD or other networked platform. It will not merely be classroom-friendly. It will be user-friendly, regardless of the location of the learning. Students will want to spend time here. They will have a strong voice and hand in what it looks like and how it operates. Students will be able to enter products that are not necessarily curriculum related, such as personal video and machinima creations, art work, game scores, business ventures, and products of personal and passionate interest. The work will belong to the students. Students, teachers, and parents will participate in selecting the work that is assessed. Assessment will be school-based, government-based, and community-based. It will preferably be open source, but not necessarily so. The social aspects will be reasonably open. Students (and teachers) will be able to collaborate across classroom and school (and even national) boundaries. Assessment will be based on content, quality & compellingness of the communication, and value. All learning products will include an element of reflection by its producer. It will become the talk of the town. Please suggest your own features. I would love to see this happen before the next NECC. Author David WarlickPosted on July 5, 2009 July 5, 2009 Categories educationTags ebc09, education, eportfolio, necc, necc09, technology, warlick40 Comments on The Next Killer App? I’m here, at NECC, for only two and-a-half more hours, so I need to squeeze in as much as I can. So what am I doing? I’m at the blogger’s cafe. The interesting thing about such a big conference that is so multidimensional, is that you can hardly turn around without learning something. I step in the Second Life Lounge, and not only am I re-introduced to some of my best virtual friends (without the purple hair), but I turn around and there’s Steve Dembo, presenting somewhere in this complex, but displayed on a large LCD. Walking throught one of the large open halls, I run across the Games & Simulations Lounge where I talk for a minute with Jeremy Koester and then get the five minute pitch on a couple of the games featured there. As context to my reaction, I go back to the Leadership Symposium yesterday, and some of the general theme of conversations here at NECC — that it is a time to blur the walls of schooling, to recognize and respect the opportunities that we and our students have to learn outside of our classroom walls. The Internet and the new flow of information that has resulted from Web 2.0 applications offers an anytime/anywhere learning environment — where learn becomes a lifestyle, not just something you do in school. Yet, both of the games I learned about were constrained by the rules of the grant providing organizations, a desire to produce a game experience that could be safely administered in traditional classrooms. Both of the representatives I talked with admitted that the games would have been something different, and probably better, had it not been for the insistence for classroom-ready products. They wanted the games to be schooly — and in my opinion, they stopped being games, at least from the perspective of the gamers that many of our children are. We need to object to this and to be more vocal in our proclamations for learning lifestyles that are independent of time and space. I’m finishing this up at the San Francisco Airport, one more leg to New Zealand. It’s currently 8:20 PM on Monday, and I’ll land around 5:00 AM on Wednesday — somewhat west of the DateLine. Blows my mind. So it probably isn’t changing the way that we live, in any substantial way, but it is a very useful, and for many, a very essential tool for sharing and learning. There are many ways to describe Twitter — none of them foolproof. 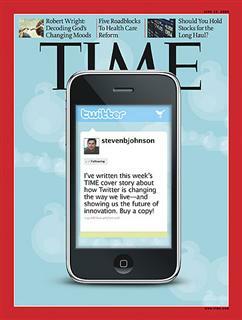 But in the context of this series, it would probably be most useful to say that Twitter is micro-blogging. When we blog, we type what we want to say into a textbox, submit or publish it, and our message is available to a global audience. Twitter works exactly the same way with just a few differences. First, and perhaps foremost, Twitter messages (or tweets) are limited to 140 characters. So the messages are short, taking little time to write and little time to read. Another distinguishing feature is that you can not comment on tweets in the same way that you can with blogs. However, you can reply to specifics tweets, which automatically places @tweeter in the message, tweeter being the user name of the person who posted the original statement. Another important difference is that although tweets are technically available to a global audience, under most circumstances, the only people who automatically receive your tweets are people who have clicked to “Follow” you. This concept has created an interesting authority dynamic, where your “importance” is based on the number of followers you have compared to the number of people you follow. The formula is flawed in a number of ways. For instance, I do not follow very many people, 62 at present. So my importance is deceptively high. 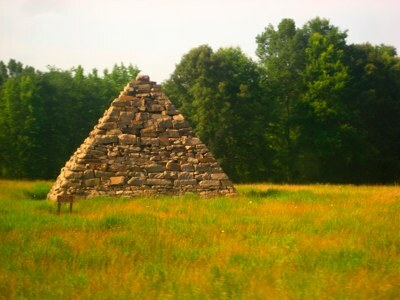 But it is interesting, none-the-less, this sense of measuring and drawing meaning from our information landscape. So, the first thing you have to do is to set up a Twitter account. Here is a YouTube video that will walk you through the process. It’s easy. The second thing to do is to start following some people. There are a number of services on the Internet that can help you find people to follow. Twellow is essentially a directory of Twitter users. Click [Browse] and then click [Education]. This reveals a number of subcategories, such as e-learning, educational toys, teachers, librarians, etc. If you are a librarian, clicking that subcategory will list the nearly 5,000 school librarian Twitter users, listed in order of their number of followers, so those at the top of the list, with thousands of followers, may be good folks to follow — initially. Another service called Twits Like Me actually match the nature of your tweets to those of others, intelligently suggesting potential friends to follow. Make sure you are logged in to Twitter, and then type your username into the Twits Like Me textbox and click [Who is Like Me]. The service kept timing out for me so there may be a significant problem with the service — or it may have just been me. You might also try MrTweet. I’ve only just signed on, so we’ll see how it goes. For the purpose of the upcoming National Education Computing Conference, we can find people who are already tweeting about it, by going to Twitter Search. This is a search engine for the Twitterverse, and typing in necc with a click of the [Search] button reveals a list of the most recent Twitter messages that mention the four letter string. Scan the messages, looking for people of interest. Click their usersname and in most cases you be able to read all of their recent tweets. If it looks like someone who might help you have a better NECC experience, then click the [Follow] button just beneath their icon. ..and here is the power of Twitter — that the entire conversation can be searched for the latest that is being said on virtually any topic. And if you have been following me, you’ve probably already trained your eyes to catch the little orange RSS symbol. So we can follow tweets related to NECC as well as blogs. Below is my NECC Netvibes page with NECC tweets coming in. Following your Twitter conversations can be difficult. Fortunately, you are not limited to continuously updating the Twitter web page. There are a number of third-party applications, Twitter apps, that monitor your Twitter account for you, notifying you of new tweets from friends. 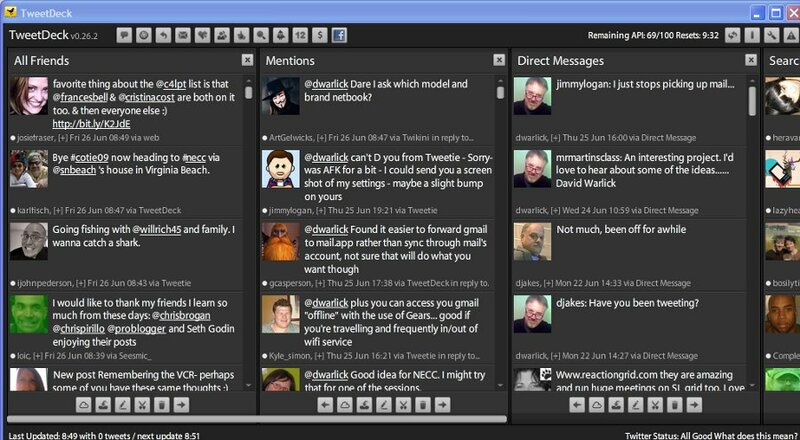 The Twitter web site has a listing of applications here, one of which I am especially fond of, called Tweetdeck. In fact, I think I learned about this application at NECC last year. But, hands down, Twitter will make NECC a more valuable experience for one and all. …was, then blogging would be little more than a bunch of web pages posted on the Web — thousands per minute. There is some sophistication behind the simplicity of blogging that kicks up its value, especially when blogging around a common topic or experience. No truer statement have I made, ’cause thar be magic in them thar hills. First, it should be no surprise that the blogosphere (where blogs live) can be searched. Google has an excellent and fairly thorough blog search engine, Google Blog Search. Or you can just go to Google, do your search for web sites, then click down the [more] menu and select [blog]. I wonder what it would be like to follow the “swarm” at NECC. Just go where others are going & not look at the program. In a sense, this is what we can do, during and after the event — we can follow the swarm around by reading their notes, and even engaging the swarm through comments. Dave Sifry, the CEO of Technorati, says that “…the blogosphere is the exhaust of our attention streams.” We have never been able to do this before, take what you and I are paying attention to and lay it down onto the record. Sifry continues, “…they are a tangible reflection on what we are spending our time and attention on.” ((Sifry, David. 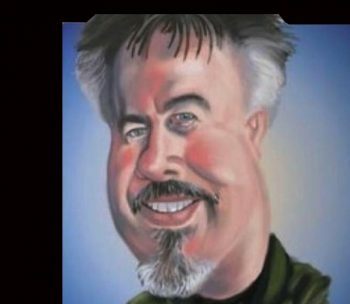 “Oct 2004 State of the blogosphere: Big Media vs. Blogs.” [Weblog Sifry’s Alerts] 14 Oct 2004. 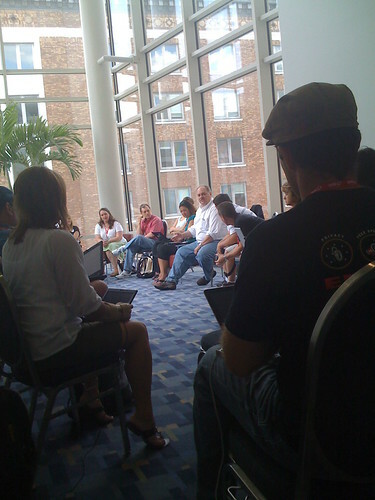 Technorati, Inc. 23 Sep 2008 <http://www.sifry.com/alerts/archives/000247.html>. )) ..and it is recorded, accessible, and measurable — in some pretty astounding and revealing ways. But more on that later. 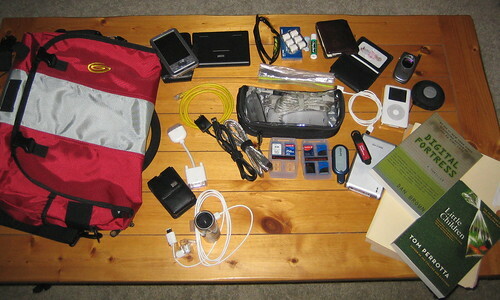 What we get from Google is blog postings that included necc09, which in this case is pretty useful. But if I go to Technorati and type the same thing, I get the 66 most recent blog posts. 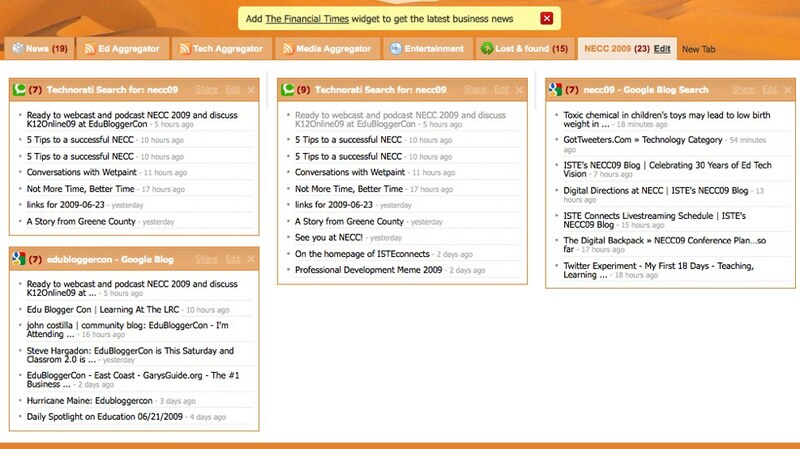 If I drop down the second menu in the search line, and select [tags only], I get the latest 26 blog posts where the blogger tagged or labeled their blog with necc09. If I drop down the third menu and select [some authority], we get, at this writing, the 22 most recent blog posts that mention necc09, written by bloggers who are respected by other bloggers. Your authority is measured by Technorati through the number of other bloggers who have linked to your blog. This is a bit of a slippery thing as there are lots of reasons why a blog may link to your blog. However, this appears to be reasonably reliable way of measuring a bloggers creds. With this URL, you can do some pretty magical things. For instance, I can go to a web site called Netvibes, set up an account (click [signup]), create a new tab, called NECC 2009 (click [New Tab] and type NECC 2009), and then click [Add content] in red in the top left corner of the page. 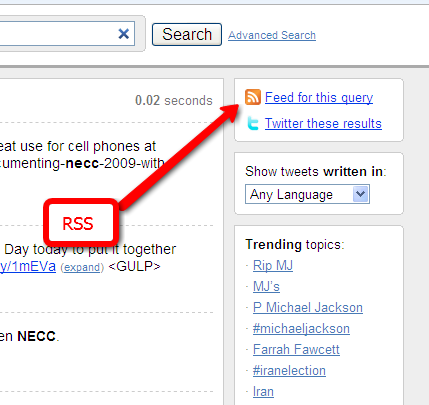 Click our RSS symbol, and paste the URL (above) into the appearing textbox. After a moment a small “FEED” box appears. We click [add], or drag the box into our window space, and presto (see left). We might go through the same process to list bloggers with any degree of authority and add a second box listing the latest blog entries. 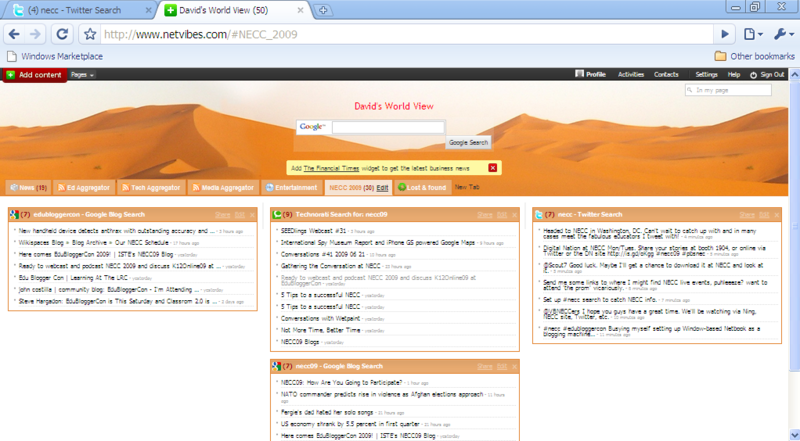 We could even drop back to Googles Blog Search, search again for NECC09, and get a reference to RSS in the left panel. Add that one in (see right). The result is a single web page that we can visit to catch the latest that is being written about this year’s National Education Computing Conference, starting in three days in Washington. 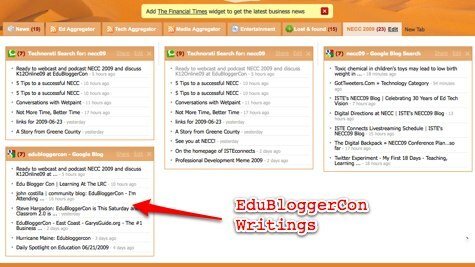 If we are also interested in the happenings at the third annual EduBloggerCon, held on Saturday at the conference site, we can do a Google Blog Search for EduBloggerCon, move that RSS feed over to Netvibes, and we have added yet another box, the latest being written about the bloggers’ gathering (see below). Pageflakes http://pageflakes.com/ Another YouTube Video about setting up and using PageFlakes. Netvibes http://netvibes.com/ A YouTube Video about setting up and using Netvibes. Most Browsers can also incorporate RSS feeds. You can even geek this out and display RSS feeds on your web page or blog. Using Feed2JS, a tool, brilliantly coded by Alan Levine, we can generate a Java script, plug it into our web page (or blog entry) to generate a list of the 10 latest blog posts that mention edubloggercon. He has made his tool distributable, so here is the version on Landmarks for Schools. This is magical, in my opinion. We are able to not only access flows of information, be actually redirect it, re-combine it, further working the information to make it more valuable and to improve our own capabilities. It turns an event, such as an education conference, into an explosion of knowledge and experiences. It’s how we learn in the 21st century. It’s a huge part of how teachers teach! A common feature of some of the most successful Web 2.0 applications is their simplicity, and nothing has demonstrated this more than blogging. Blogger.com, a free blogging platform from Pyra Labs, was launched on August 23, 1999. (( Yassar, Isaac. “The History of Blogger (www.blogger.com).” [Weblog Isaac Yassar’s Blog] 6 Mar 2009. Web.24 Jun 2009. <http://isaacyassar.blogspot.com/2009/03/history-of-blogger.html>. )) Suddenly, anyone with access to a computer and the Internet, and the slightest typing skills, could publish to the world — for free. Type the title of your article into a textbox, type your article, click [Publish], and your words are available to a global readership. The simplicity is its power and its impact has been profound. Many people at NECC will be blogging. 129 people have already registered with the NECC web site as conference bloggers. Many more will be blogging more casually, simply as a way of recording their experience and notes about what they are learning, for their own record or to share with colleagues at home. If you already have a blog, you can register it on the NECC site by filling in a form. In fact, there are usually a handful of people who blog the conference without being there at all — but writing about the blog articles posted by people who are there — filtering in the best. If you do not yet have a blog, it is surprisingly easy to set one up. Here is a list of the blogging platforms I usually recommend in my presentations and workshops. They are all easy to set up, easy to use (though they offer many sophisticated features), and they are reliable services. There is also a link to instructions and/or a video on how to set up an account. I have also been playing around with Blogsome, a free WordPress hosting site out of Ireland, and enjoying it. There are other opportunities, including blogging with Ning. Ning is a service that allows users to establish facebook-style social networks, and NECC has one that can be joined by joining Ning. All NECC Ning members automatically get a blog, but there may be a disadvantage here. NING blogs may not show up on blog searches, which may suit you fine, but would not serve the broader expanding conference experience. If this was all there was, then blogging would be little more than a bunch of web pages posted on the Web — thousands per minute. There is some sophistication behind the simplicity of blogging that kicks up its value, especially when blogging around a common topic or experience. Tagging is the key and it involves applying tags or labels to your blog (or other published media). Many conferences have established tags, though NECC does not seem to have established one this year. That is not a problem as it is usually pretty simple. NECC is a good tag, though it will include all NECCs, not just the 2009 event. So NECC09 or NECC2009 are also good tags. The safe bet is to use all three. It is also a pretty good idea to tag the session you are blogging. I usually use the last name of the main presenter. But tags should be a single word that you believe others might search for if they were interested in the event or presentation. Much of the time, simply including the tag in the body of your blog is enough. But there is a syntax to blogging that some information gathering services on the Internet prefer. 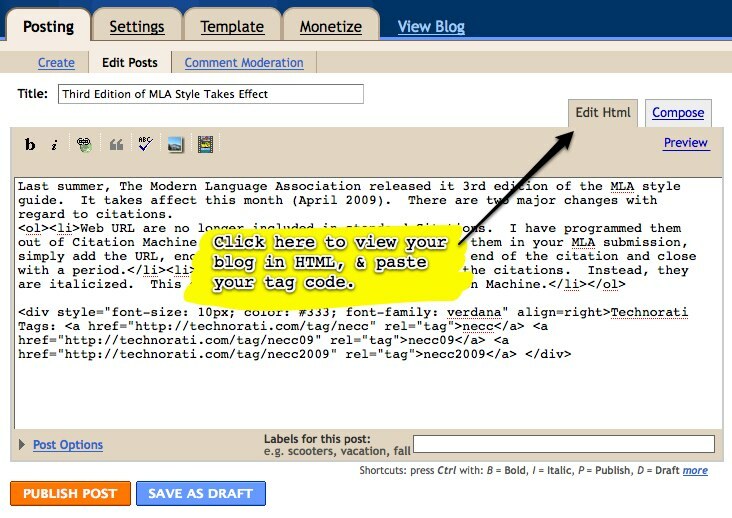 Most blogging services include a feature for entering your tags and it will create the syntax for you. But there are online tools and a variety of widgets that will do the same for you. 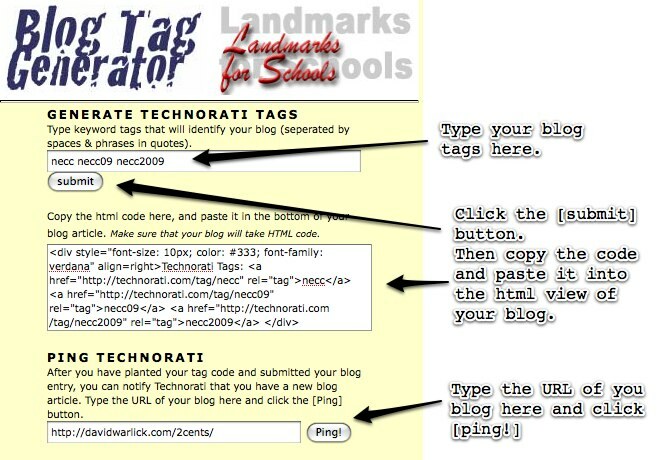 I have a tool, that is part of Landmarks for schools, called Blog Tag Generator. Type the tags (necc, necc09, necc2009) into the first text box. If you are using phrases (21st century skills), then enclose it with quotes. Click [submit]. This will generate the code syntax for your blog, which will appear in the larger textbox. Highlight and copy this code. Got to your blog, click to see the source or html (you may to look for this button) and then past the code at the bottom of your blog. Type the URL of your blog into the third textbox and click [ping]. this will cause Technorati, a major blog indexing service, to capture and record your blog. This last part has gotten a little technical, and it is certainly optional. But I will explain its value in the next post of this series. One more note: You are not required to wait until you reach NECC in Washington to start blogging it. 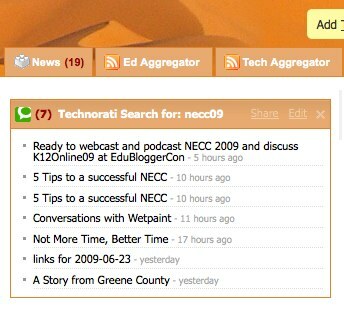 Technorati has already indexed 33 posts with necc09 and 18 with necc2009. Google has indexted more than 3,000. This came to me the other day from Mike Kruger, Online Outreach Specialist for the Committee on Education and Labor, U.S. House of Representatives. Chaired by the Honorable George Miller, the committee is apparently holding a series of hearings about the future of learning. Mike pointed me specifically to the testimony of Abel Real, a current Freshman at East Carolina University, and graduate from Greene Central High School in Snow Hill, NC. It’s a compelling story about the potential impact that respecting our kids with efforts to modernize their classrooms and learning experiences can have. Technology helped me to create, learn, explain, document, and analyze the different aspects of my life. I can’t think of a better way to describe what education is supposed to do. 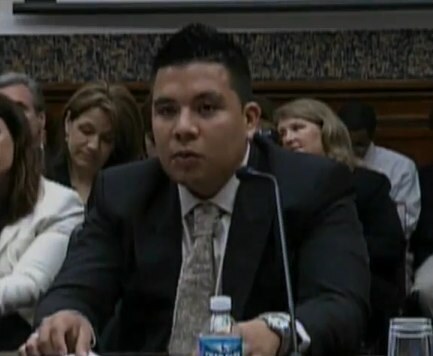 You can see Abel’s testimony here and a listing of the other June 16 testimonies at the committee’s YouTube Channel. As we attend NECC next week, we should keep in mind that the reason we are there is so that this might become a common story. Blogging NECC is an excellent thing to do for lots of reasons. First of all, it is a useful way to take and keep your notes from sessions you attend, appealing products you find in the exhibit hall, and people you mean and conversations you have. 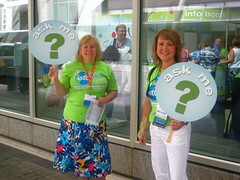 Blogging NECC is also a wonderful way to share with colleagues at home your new-found knowledge, friends, and insights. Blogging NECC also earn creds — it will get you read. Thusfar, by “blogging,” I mean any journalistic recording of experiences at the international conference that might be discovered by other people — and discovery by other people is exactly what you should be striving for. 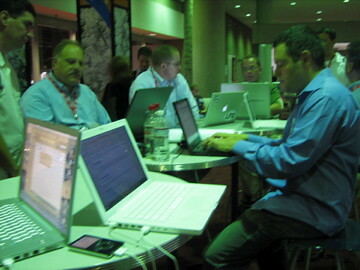 Blogging conferences adds a new and potent dimension to the event. It extends the knowledge and energy generated by the conference beyond its geography and its time. 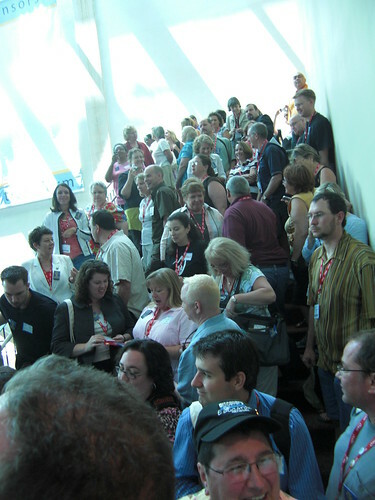 Networking a conference also extends your experience by giving you a variety of perspectives. You are not only able to visit presentations and workshops you were not able to bodily attend, by reading the bloggings of those who were; but you are also able to re-attend sessions that you did experience, by reading the bloggings of others in the room. With a few days at home, and a semblance of routine, I plan to write a series of blog posts to help you extend the conference experience, utilizing your laptop, cell phone, and free tools available for registration or downloading. We will look specifically at blogging, micro-blogging (Twitter), and photo-blogging (Flickr). If there is another W2 avenues to cover, please comment it here. If you want to add your own insights and tutorials, link them here and/or tag your blogs with bloggingnecc.